Women are encouraged to step up and catapult their personal, spiritual and business growth via an empowering virtual (online) event. Imagine receiving insight from 21 savvy spiritually empowered Christian Women Entrepreneurs who are experts in various fields that will catapult your personal, spiritual and business growth from the comfort of their home. The information shared is valued at thousands,however, you won’t pay that. 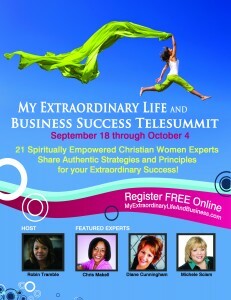 The cost of this empowering event is FREE! Discover insider tips and Authentic strategies without the hype. 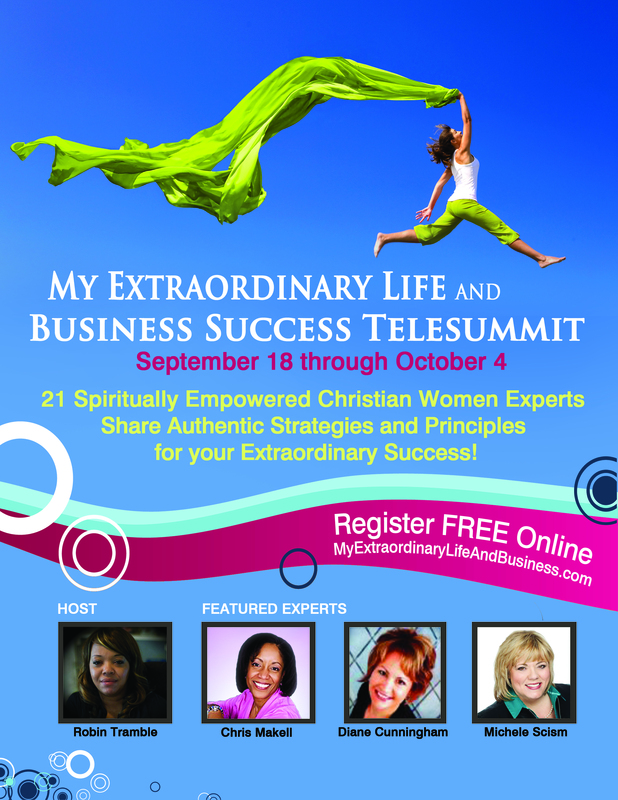 The Extraordinary Life and Business Success Telesummit will include topics on business success, social media including blogging and various Social Media Platforms, life balance, health and fitness, mindset, empowerment, wealth consciousness, spiritual empowerment, overcoming challenges and more. Our featured speakers include: Robin Tramble, Chris Makell, Diane Cunningham and Michele Scism plus 17 additional Speakers. We invite you to take advantage of this empowering event. Your life will be enriched and your personal, spiritual and business growth will be catapulted! Realize Rejuvenation, Empowerment and Spiritual Renewal. Of course we encourage you to make all of the calls, however, you will have access to the replay for a limited time. If you desire to secure a permanent copy for your collection you will be given an opportunity to do so. You have nothing to lose and so much to gain! Robin is CEO and Founder of Robin Tramble International, She is America’s leading Authentic Empowerment and Certified Social Media Marketing Specialist, Mentor, Trainer, Coach and Public Speaker. Robin is also known as Empowerment Diva because she has carved out a niche in the area of empowerment. She recently shared her empowerment tips on Good Day Sacramento as “Empowerment Diva” and was named 1 of 25 urban Entrepreneurs to follow on Twitter by Brand maker News. Robin is also an accomplished keyboardist, singer and songwriter and plans to incorporate her musical gifts with her resources for women’s empowering personal development.